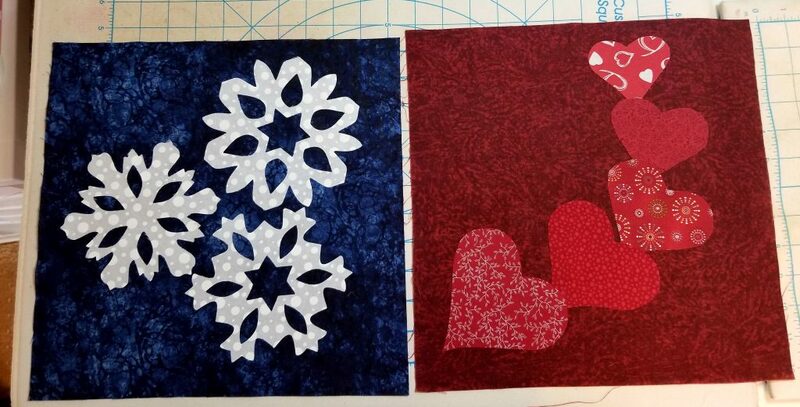 First I want to share January and February blocks from Sharon K. Didn’t she do a great job? Very pleased to see my designs grow in someone else’s garden! At least I have two names in the hat for the UFO drawing at the end of the year. Remember I said I was going to collect the names of all those who shared UFO’s? You can also get your name in the drawing. Just send me before and after pictures of something you finished or pictures of my appliqué blocks you finished! They will be shared here on the blog. Another non-quilted item of mine finished. Purchased the yarn for at least 5 years ago. This is my own pattern based on other knitted vests of mine. I prefer to knit in the round. 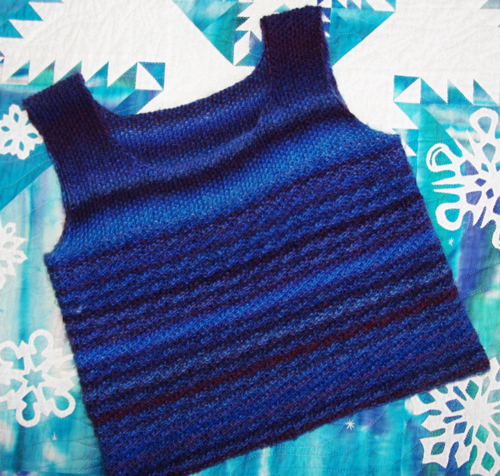 The body of the vest is done in Rib Stitch Gone Wrong and the upper portion knitted in Seed Stitch. 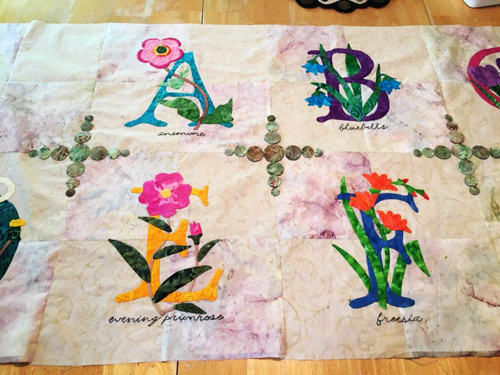 SLOWLY, finishing the Alphabet Garden Quilt top. The border is designed, and I will get started on that as soon as I finish the butterfly corners. Step by step, I am getting there. Here is the mock-up of it. I used the blocks for the center, really like the way it looks. Have to finish the corners first, the only way I can put the quilt top together. 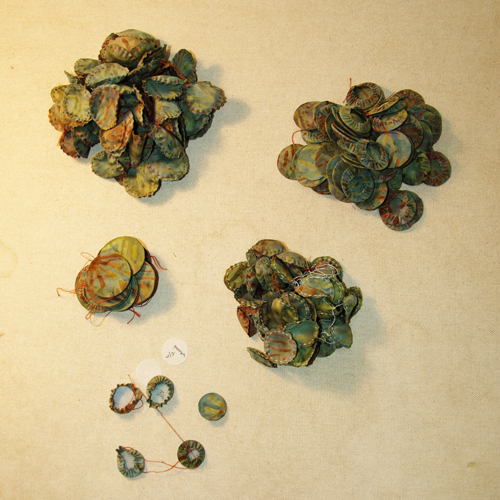 Then on to appliquéing the gathered circles. Hundreds of circles, what was I thinking. After a while, it felt like thousands! Right, Mary? Here is part of her quilt already put together. At the time it sounded like a good idea and it will really be pretty once they are appliquéd in place, but I didn’t stop and think how long it would take to trace, cut, gather and press 312 circles. Let alone the time to appliqué them! Are you asking why? I thought the blocks needed to be set apart from each other. I could have done it with a sashing strip, but that is what everyone does. I also could have designed a simple shape to go in each corner, but what is done is done. 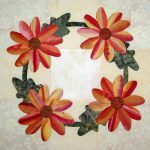 You might want to come up with your own idea or just use a sashing strip if the circles don’t appeal to you. Afterall this is your quilt! Another reason was to cover where the blocks join. If you are very careful and all your corners come together exactly, then you can skip this step. 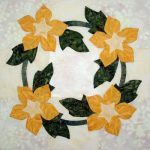 I am also planning on using a smaller butterfly here and there across the quilt on the seams that join in the center of the block because I am sure that no matter how carefully I trim the blocks those joinings will need covering as well. They will fit right in with the ones in the corners. I also have decided to make more work for myself and place diamonds where the center of the blocks come together and will replace those with small butterflies here and there. Thank goodness for a long drive 5 hours one way to Northern California and those short trips to town, Los Angeles, and Bakersfield. It is amazing how many I was able to gather while riding in the car. My husband prefers to drive so that gives me lots of time to do hand work. 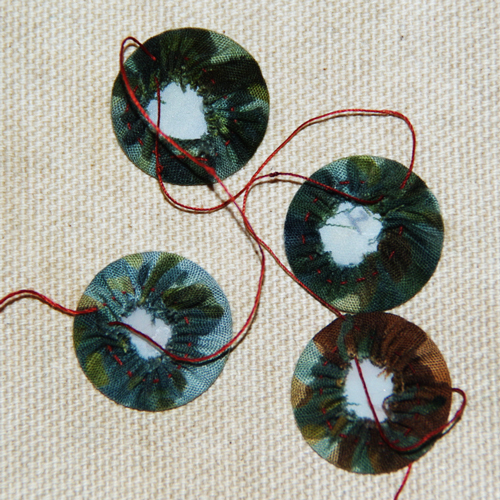 After I make the running stitch around one circle, I make a knot and move on to the next one. Don’t know if I am saving time, but it feels like it! If you have ever done yo-yos, it is basically the same technique, except you will be using a circle template to shape it into a perfect circle. 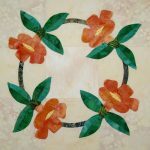 Run a small gathering stitch around the edge of a fabric circle. 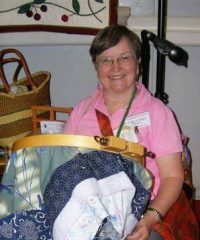 Insert the appropriate size circle, pull the thread tight, dampen with liquid starch or fabric sizing, press with a hot iron. I have found that after the gathering thread is dampened and tightened it really stays in place. It does not loosen. Press with a hot iron, let cool, snip the thread and remove the template. Instead of freezer paper circles, I punched circles from heat-proof template plastic the appropriate size. That is what you see inside the gathered circles. I also found that quilting thread is better to use for gathering, less likely to break. 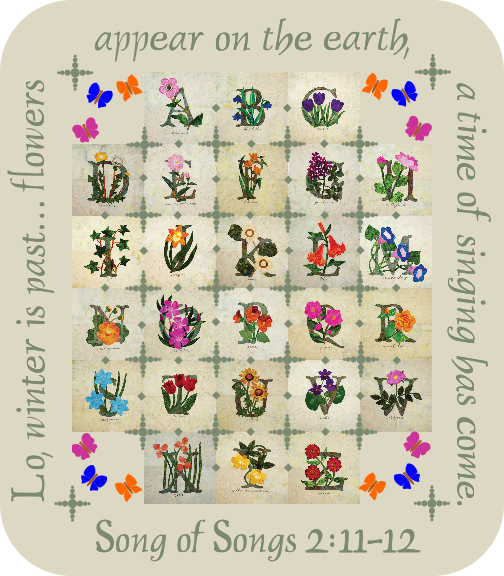 Click on the link below to take you to the page with the 2018 blocks and the pdf for the border letters. I love, love, love the circles! Having the patience to appliqué them all is another story. I hope you will be offering these letters in a set to purchase. I collected them all but lost them when my document drive crashed. Thank you for your beautiful patterns! Yes, patience! Definitely. I do plan on offering the blocks, border, and assembly directions as an ebook available through Craftsy. Working on it now in between finishing UFOs. I don’t see the fourth block as you notified us. What am I missing? You aren’t missing anything, for some reason the scheduled update didn’t appear. It is there now. Click on the Blocks for 2018 and it will take you to the main page, then click on April! I’m glad Sharon sent you photos of finished blocks. It felt like we were the only two with UFO’s. You just had to add the diamonds didn’t you! I’m still doing circles, we’ll see if I do diamonds. I’m almost done my next UFO. I’ll be taking some time off for knee replacement surgery, but when I’m recovered I’ll send a photo. Yes, I know adding diamonds? Crazy! Look forward to seeing your UFO and hope to see some from other people too. Seems we are going down the same path. Knee surgery is probably on the schedule for the end of the summer for me.